I owe this story to the Shropshire Star and Bridgnorth resident John Mayne who dug out the data via an freedom of information request. Mr Mayne asked how much Shropshire Council had spent on capital projects in each area of the county. Nearly £45million has been spent on capital projects across the county since 2009. Just 1% of this was spent in Ludlow and Church Stretton. The Shropshire Star has published figures for capital spend per head. They make equally grim reading. Ludlow and Church Stretton get by far the lowest share of the public purse. The money that been spent in in Ludlow has been invested on the Buttercross Museum, Mascall Centre, Ludlow Assembly Rooms and a few other projects. More than £90,000 was spent on Church Stretton Leisure Centre. Further details are in the Star. Investment in our roads in the south of the county? That’s a joke. And Shropshire Council is reducing its day-to-day spend in the south of the county, including on customer services. It closed the council offices at Stone House and flogged it off. When I asked former council leader Keith Barrow to divert some of the sale price to Ludlow, he said: “Andy, you have to realise that this is not about Ludlow. It’s about Shropshire.” What he really meant was that it was about Shrewsbury and Oswestry. I am depressed but not surprised by the numbers published in the Shropshire Star. Shrewsbury has shown little interest in the economy of the southwest of the county. We need a rural regeneration zone to draw investment into the southwest. We need a national park. But frankly, the last thing we need right now is Shropshire Council. We are subsidising the north of the county through our council tax. That’s not right. As I have said before South Shropshire people voted against us becoming a Unitary Authority but the powers that be – notably Heather Kidd – denied us out democratic right and went against this vote. Perhaps if she and others involved at the time had gone with the vote we would still be SSDC and would be able to control our finances. That said I and many others hugely admire you Andy Boddington for your efforts. Perhaps it’s time we had a huge march on Shirehall from the southwest of the county (Bridgnorth, Ludlow, Church Stretton ) to demonstrate to the council how fed up we are with them. 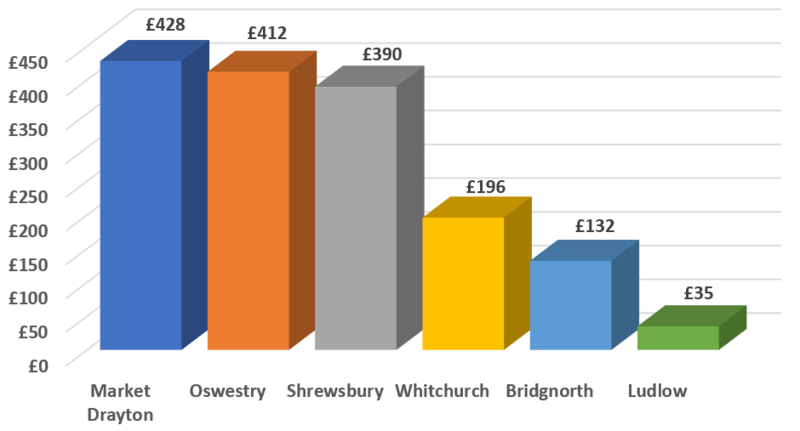 Looking at your graph there is twelve times difference in the spend between Market Drayton and Ludlow. There must surely be central goverment rules to prevent such a situation ? Why does our MP Mr Dunne not act …. I thought he was there to represent our interests . It’s not surprising we get only 1% of the capital expenditure. 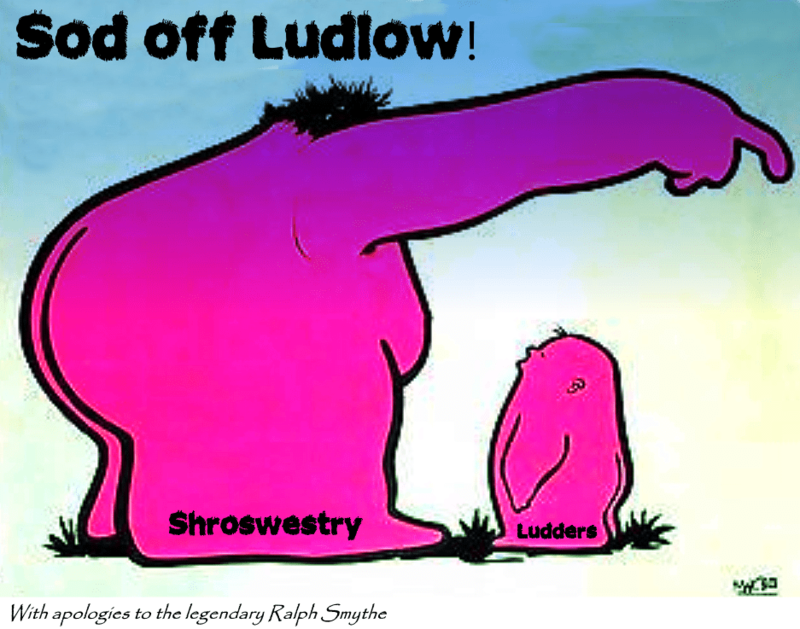 Ludlow has Lib Dem Councillors, and a Tory Council punishes us for our temerity to elect them. Keith Barrow was right. It’s about “Shropshire” and “Shropshire” is Conservative. On the plus side we have enlightenment.